Enjoy the Amakhala's fun activities both on site and in the surrounding areas. Amakhala Game Reserve, voted best game reserve by East Cape Tourism, has quickly become one of the finest tourist destinations in the ecologically diverse Eastern Cape province of South Africa. 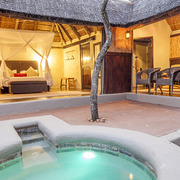 Amakhala is a malaria-free reserve which boasts being the home to South Africa's Big Five. The Amakhala Volunteer program offers an informative and unforgettable conservation experience perfectly suited to your gap year or as an opportunity for a little breather between career changes. Amakhala's ethos is one of both conservation and community support and through this program we offer you an insight into the environmental issues and the management of a private game reserve whilst also providing a positive contribution to the vulnerable children of our local community through the weekly involvement at the Isipho Care Centre. Volunteers on Amakhala are actively involved in the continuous monitoring of the lions, elephants and cheetah, as well playing a role in the rehabilitation of the the land to its natural state through alien plant and erosion control and assist with the maintenance of fences and roads. Reserve priorities continuously change depending on many external influences; therefor the involvement in certain short term projects regularly occur. 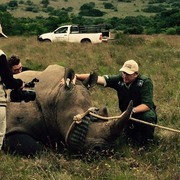 These could include assisting the vet in ecological work like the relocating of animals for genetic reasons or the control of population numbers to assisting with post-mortem autopsies to establish and monitor potential diseases. Every week includes a fun day out which include trips to the Addo Elephant National Park, to SAMREK, the penguin rehabilitation center in Port Elizabeth, a 7km forest walk through the Alexandria forest and a beach walk to the Dias Cross. Canoeing and boat cruising on the Bushmans River which runs through Amakhala Game Reserve focusing on the riverine bird life. The longer you stay as a volunteer on Amakhala Game Reserve, the more in depth your involvement will be across many facets of ecology, conservation and reserve maintenance and social responsibility. Conservation activities cover involvement in aspects of both animal and land management. The tracking and monitoring animals, particularly the monitoring of the predators and their impact on the population numbers of their prey, forms a core of the work done by the volunteers. When animals are introduced or relocated, the volunteers sometimes have the opportunity to assist the vet and ecologist in the process. Land management activities includes the monitoring of grazing patterns, road and fence maintenance and the removal of alien vegetation. Volunteers are actively involved in assisting the Amakhala Foundation's commitment to environmental education to school going aged children, mostly from the disadvantaged communities of the area. These exist in the form of activities themed around days like Arbour Day, World Environmental Day, Water Day etc held at the Amakhala Conservation Centre. Volunteers also assist the environmental educator with the newly formed environmental club at the local High School in Paterson. The Isipho Centre in Paterson cares for orphans and vulnerable children of this rural town and the volunteers spend two afternoons a week assisting with a beading project, maintaining the veggie garden and playing games with the children. A highlight for volunteers that stay longer than two weeks is the opportunity to experience a one night stay at the luxury Safari Lodge on Amakhala. During our summer months we do overnight camping under the stars on the reserve. Other fun activities include, target shooting, star gazing, canoeing and boating on the Bushman's River, beach and forest walks on our pristine coast, guided walks focusing on amaXhosa culture and the medicinal use of plants endemic to our area and outings to Addo Elephant National Park and the penguin rehabilitation centre in Port Elizabeth.